As many of you already know, we have many family-friendly holiday-themed events throughout the year. With Easter quickly approaching, we've already scheduled our 4th Annual Bunny Run! 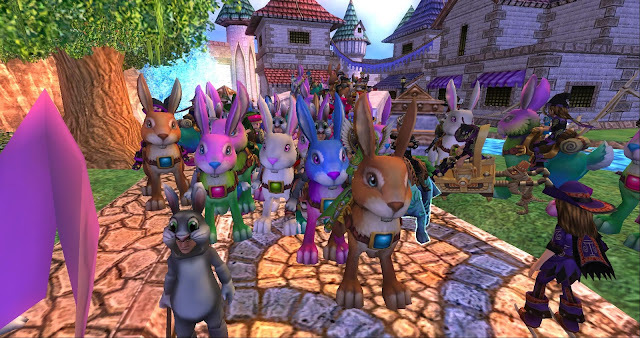 This year's Bunny Run is set to take place on Sunday, April 28th - The Commons, Greyrose Realm! Keep reading for a video guide of where we'll be running, a schedule of activities, and more. Everyone is invited to attend the Bunny Run - rental bunny mounts will be provided to all thanks to Kingsisle. If you do plan on attending, please remember to keep the event family-friendly! I'd also love to thank everyone that has continued to show support for these events. They do take a lot of work to prepare, but your support for these, especially after years of having them, is well worth it. It's going to be a lot of fun hanging out with y'all at our 4th Annual Bunny Run. Feel free to invite your friends by linking them to this post! We hope to see you there!